ElectronicKitSchool. - One again Proteus 8 professional with it version added is Proteus 8.8 SP1 for Windows for you who want to create simulation electronic and microcontroller now and design PCB layout easily with it features. 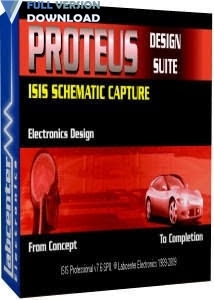 Proteus 8.8 SP1 for Windows with new many advantages will give you many advanced simulation in electronic project and PCB layout design with ISIS and ARES that allow you to design electronic circuit and simulate it and then you also can create PCB layout design at once using this software. In this article we will give you global overview about Proteus software, the features, system requirement and the last we will give you the link that allow you to take free download Proteus Professional Version 8.8 SP1 for Windows system. And now you can click the icon link below to continue download Proteus Provessional v8.8 SP1 for Windows. There are two files that you show download. Electronic Kit School. - This is the idea and implementation of remotely editing the text or message of the LED Matrix Display (Custom LED Signs) are presented. 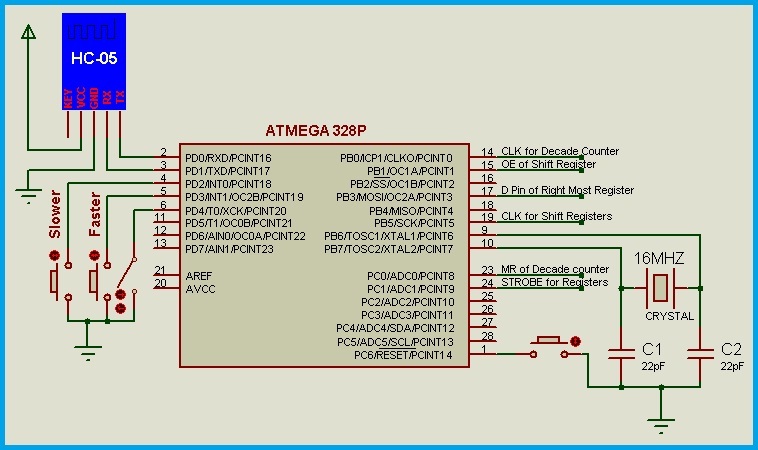 Circuit like in Figure 1 above show you about the Bluetooth Based Programmable LED Message Board Circuit Based on ATMega328. From Circuitstoday site describe that the message or text can be edited to bring custom LED signs by connecting the Display to a computer using a Serial cable (RS-232). The RS-232 Voltage level is converted to TTL Level using a level shifting IC (MAX 232). The serial data sent by the computer is then processed by the microcontroller of the Display circuit. The new message is stored in the EEPROM of the microcontroller. 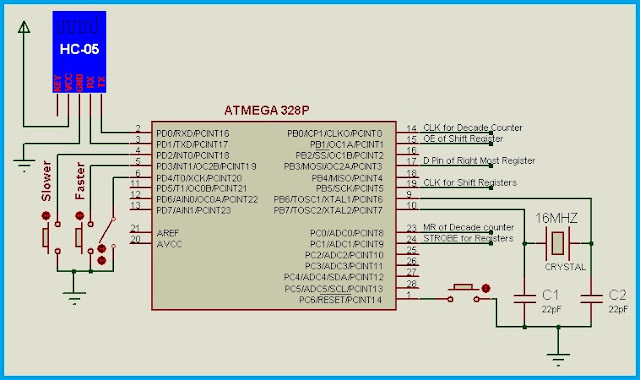 At every start-up or Power ON, this data is read from the EEPROM of the microcontroller and thus the message is displayed. The idea is not limited to computer-based editing. It can be applied to any type of data transmission, which uses UART mode of serial data transmission, it may be wired or wireless. Nowadays, the Bluetooth feature of the smartphones is commonly used for remote control applications. The same can be used to edit the message of the Display as well. Below is the demo which shows editing the message using Bluetooth feature. ElectronicKitSchool. 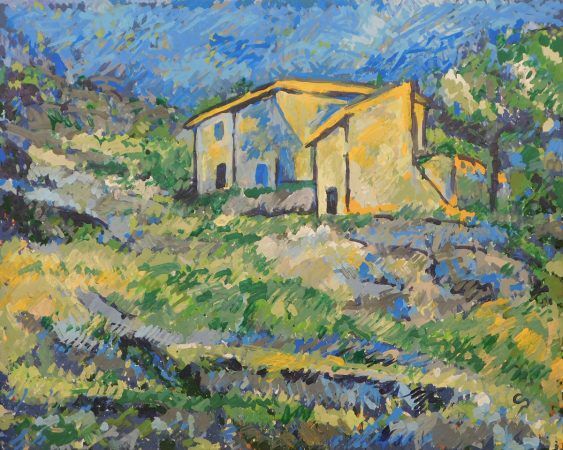 - This is one information update from robot technology news 2018 in this time with the article titled Robots Made These Paintings and They're Very, Very Good that written by Laura Yan and published in Popular Machines site. And now you read more about Robots Made These Paintings and They're Very, Very Good that written by Laura Yan, from original source using link HERE. Electronic Kit School. 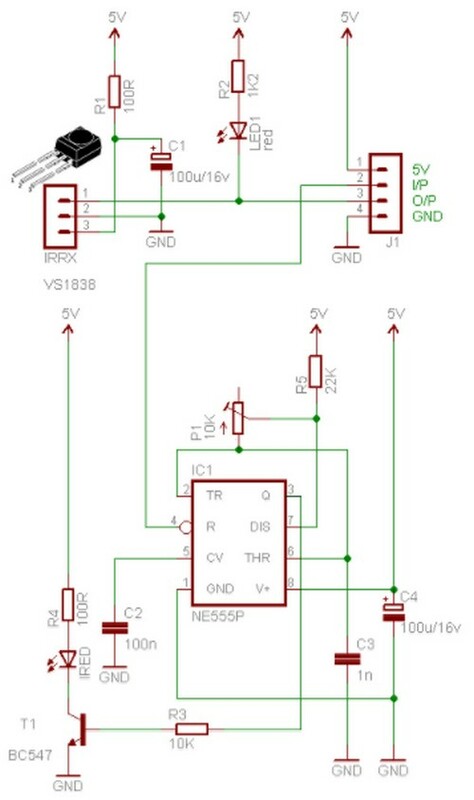 - This is the simple circuit for sensor and alarm application to build solar plant watering automatically. This circuit will give you indicator as sound when the soil in the plant is drying. We thing this circuit is very simple and useful to you to save your plant from the die, rather that this circuit not need battery, but supply from solar cell. So, you can create this circuit to help your work at home. 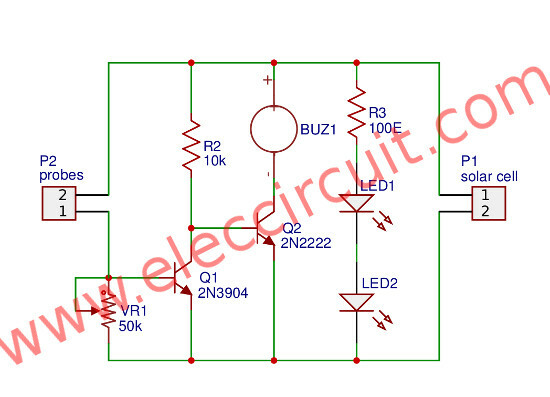 The main component to build this circuit also very simple, consist of resistor, buzzer, transistor, LED, and also solar cell which popular today. In this time, beside we will show you the circuit, here we also will show you component part and global description about this circuit. Circuit like in Figure 1 above show you about the Simple Solar Plant Watering Alarm Circuit Based on Transistor. From Eleccircuit site describe that the main principle is that when the soil is dry, with high resistance. However, when the soil is wet with minimal resistance. Usually the wet soil will have resistance is about 6K the electricity current will flow to the probes to base of transistor Q1-2N3904 ,makes it works conducting current from the positive voltage to CE to ground. Thus, the transistor Q2-2N2222 not has a bias current to base its, so Q2 not works no sound from a buzzer. But when dry soil, high resistance between probes so there aren’t the current flow to base of Q1 so it not conducting. Thus the current from the positive flow to R1-10K to base of Q2 it works conducting current to Buzzer sound. LED1,LED is connected in series to display power on. R2 is used to limited current to LEDs. Electronic Kit School. - This is the 38-KHz IRTR module that designed compactly with the infrared transmitter and receiver board created with the help of a couple of inexpensive components. The main component to modulated the The 38-KHz IRTR Module Circuit Based on 555 and Infrared Receiver VS1838 (IRRX) which popular today. In this time, beside we will show you the circuit, here we also will show you component part and global description about this circuit. Circuit like in Figure 1 above show you about the The 38-KHz IRTR Module Based on 555 and Infrared Receiver VS1838 (IRRX). From Electroschematics site describe that as you might have noticed, the 38-KHz pulse generator is built around the evergreen timer chip NE555P (IC1). Here, the RC components (R5-C3-P1) set the astable frequency to drive the infrared light source (IRED1) through its driver BC547 (T1) — a general-purpose NPN transistor. After construction, the center frequency must be locked to 38 KHz (±1%) by adjusting the 10K preset potentiometer (P1). A digital multimeter with frequency counter or an oscilloscope is required to complete this one-time adjustment. The pulse train can be modulated by feeding TTL level signals to the reset terminal (pin 4) of IC1; i.e., I/P of the four-pin header J1. The infrared receiver VS1838 (IRRX) hardly requires external electronic components. However, an RC-network (R1-C1) is added deliberately to suppress power supply disturbances. The red indicator (LED1) works as a pulse activity indicator merely included for occasional debugging tasks. The demodulated output signal, available through pin 3 (O/P) of the four-pin header (J1), can directly be decoded by a microprocessor. Below are snapshots of my first prototype on a perforated board. ElectronicKitSchool. 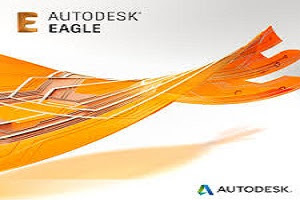 - One again Autodesk EAGLE software with it version added is Autodesk EAGLE Premium 8.2 with Crack for Windows for you who want to create and design PCB layout easily with it features. With EAGLE software very sutable for you who want to make any PCB design, print your design and also make integrated circuit. It is also will allow you to make complex board design using modern tools that provide by this software. In this article we will give you global overview about Proteus software, the features, system requirement and the last we will give you the link that allow you to take free download Autodesk EAGLE Premium 8.2 with Crack for Windows. Accordingly Izofile site that also published this software, describe that Autodesk EAGLE Premium 8 is a great solution for every electronic engineering who is looking to make a PCB design so easily. The main purpose of using this software it’s the simplicity and also the efficiency. from the first look at the software’s name you will be confident, because it’s an Autodesk product. An easy and also efficient PCB layout software for every electronic engineer. Turn your electronic idea into a PCB design. Squeeze your existing blocks of circuitry in a snap. Test your connection point by point to make sure that your Electrical rule is good. Automatic and real-time design synchronization between schematic and also PCB layout. Arrange, Select, group, and also modify your design as much as you like. Now run the setup file to install the software. Open the crack folder, copy the crack file and also paste it inside the installation directory. And now you can click the icon link below to continue download Autodesk EAGLE Premium 8.2 with Crack for Windows. ElectronicKitSchool. - This is one information update from robot technology news 2018 in this time with the article titled You need to see this giant unicorn robot in Japan that written by Chris Urie and published in USA Today 10 Best site. And now you read more about You need to see this giant unicorn robot in Japan by Chris Urie from original source using link HERE. Electronic Kit School. - There are many electronic circuit that design to get mobile charger power bank in this time. All circuit mentioned aim to result best design and allow us to use this circuit. In this time, beside we will show you the circuit, here we also will show you component part and global description about this circuit including the layout of this project for you all. Circuit like in Figure 1 above show you about the Simple Power Bank Mobile Charger Circuit using LM1086 IC. From Eleccircuits site describe that this is Power bank mobile charger circuit project to backup energy when need portable mobile phone that no electrical outlet. we use LM1086 is main on a low dropout voltage, making it has high-efficiency. When we need to take the mobile phone to location-based applications. No electrical outlet to plug in to recharge the battery. and In event that use often mobile phones. Which moderate power consumption. If the batteries run out still not certainly,Many people chose to carry a backed up battery. and another alternative is buying the Portable power pack In order to solve this problem. But the price is high reasonable, when sit think we as an electronics amateur.You can build it yourself is not difficult by use simple principal of dc regulator circuit, which Many people are already familiar. If interested, you can see that it is really simple. ElectronicKitSchool. - This is one information update from Internet of Things in this time with the article titled New Facial Recognition Access Control Product for Internet of Things that published in Electronicsforu site. This new access control product provides rapid and accurate identity confirmation using video and IR cameras and a sophisticated machine learning algorithm. The product also incorporates alternate access methods including fingerprint, QR code and mobile phone apps. The need for rapid, accurate access control is growing among companies and organizations that must govern personnel access to facilities, buildings and regional campuses. A facial recognition system captures facial images via digital camera and other sensors and verifies the identity of a person using a machine learning algorithm. Facial recognition has been perceived as the most natural and accurate way to confirm identity and prevent unauthorized access. It is also the most difficult to thwart. Dusun’s facial recognition access control product offers an extremely accurate recognition rate (99.9%), fast recognition time (0.5 seconds) and can detect faces up to 1 meter away. This product features a self-learning algorithm that can even compensate for face changes from aging. Dual digital cameras for 3D facial recognition along with an infrared radiation (IR) sensor for body recognition are provided to prevent identity spoofing using photos. 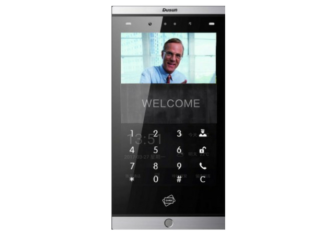 This product can adapt to bright and dark lighting with its anti-backlight capability and also provides a video intercom for instances when person-to-person communication is required. Access control and personnel identification are becoming very important to ensure that our living and work spaces are secure. Utilizing facial recognition as the basis of an access control system of IoT for granting physical access has many advantages over card reader-based access. Dusun is pleased to develop this highly accurate and efficient facial recognition access control product to add secure functionality and superior performance in an IoT access control offering. And now you read more about New Facial Recognition Access Control Product for Internet of Things from original source using link HERE.